Meralgia Paraesthetica is the condition where the lateral femoral cutaneous nerve is compressed by the inguinal ligament, due to obesity, pregnancy or belt worn too tight around the waist. The lateral femoral cutaneous nerve is part of the lumbar plexus and is formed by branches of the 2nd and 3rd lumbar spinal nerve roots. The nerve courses downwards and passes under the inguinal ligament to provide sensory innervation to the anterolateral aspect of the thigh down to knee. 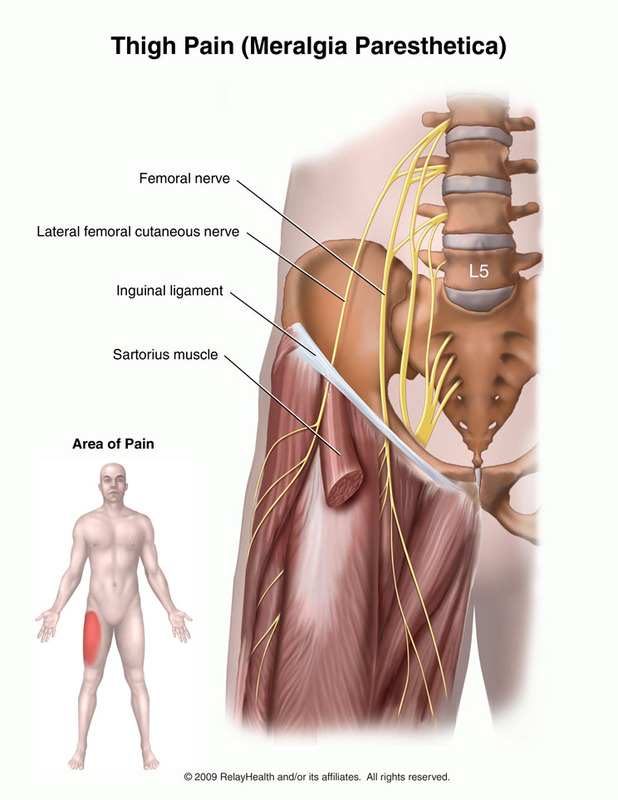 At the point where it passes under the inguinal ligament, the femoral cutaneous nerve may be compressed by the ligament, particularly in obese individuals in whom the ligament is enlarged. The inguinal ligament extends from the anterior superior iliac spine to the pubic symphysis and is hand palpable. It is characteristic that symptoms improve when the patient is seated and, on the contrary, they become worse when lying on the back and extending the hip joint. From a biomechanical point of view, this can be easily explained: when the patient is in supine position with the hip joint in extension, there is an increase of the pressure exerted on the nerve since it comes closer to the inguinal ligament. On the other hand, when the patient is seated, the nerve moves far from the ligament. Meralgia paraesthetica, which often causes unbearable pain, is very often confused with trochanteritis or radiculitis due to a herniated intervertebral disc which may co-exist, as may be revealed in an MRI. However, the real cause is a morphological abnormality and not typical sciatica due to nerve root inflammation. The differential diagnosis is made by taking a good history, for it is obvious that sciatica due to disc herniation is neither relieved with the patient in sitting position nor aggravated with the patient lying down. Moreover, the low back radicular pain rarely ends at the knee level. In addition, trochanteritis causes pain locally in the greater trochanter area and not superficially to the skin of the anterolateral thigh down to knee, which is the region innervated by the lateral femoral cutaneous nerve. EMG specifying the level of the lesion and nerve dysfunction, which in the case of meralgia paraesthetica is located more distally. Pulsed Radiofrequencyon the lateral femoral cutaneous nerve. This technique acts in a neuromodulatory way. 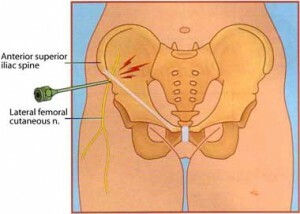 The nerve ablation (neurolysis) with classical radiofrequency or alchohol is avoided due to the risk of provoking anaesthesia dolorosa (strong neuropathic pain in an already anaesthetized area).